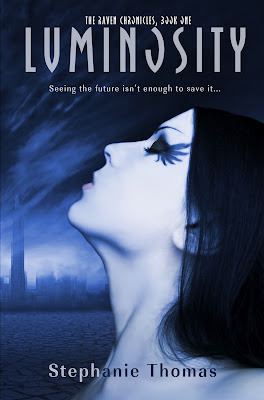 Wow, we're part of another cover reveal--this time the book is the YA Sci-Fi/Dystopian, LUMINOSITY, by Stephanie Thomas. Blurb: "My name is Beatrice. When I was born, I was blessed with the Sight. I was immediately removed from my parents and enrolled in the Institution. At the age of twelve, I had my first true vision, earning my raven’s wings. And when I turned seventeen, one of my visions came true. Things haven’t been the same since. But the enemy has been coming to me in my dreams, and I think I’m falling in love with him. He says they’re coming. He says they’re angry. And I think I’ve already helped them win." Don't forget to add LUMINOSITY to your Goodreads TBR list. The book will be available September 11, 2012 from Entangled Publishing.